Hamilton Conference is one of 13 Conferences of the United Church of Canada. It includes 60,000 church members in 245 pastoral charges.Hamilton Conference provides leadership and support to six Presbyteries (Bruce, Erie, Halton, Hamilton, Niagara and Waterloo) to enable a variety of ministries in the Presbyteries and congregations and to do the work of General Council in the area bounded by Mississauga and Kitchener-Waterloo and Tobermory and Niagara. Halton Presbytery takes in the area bounded by Highway 6 on the west, Etobicoke Creek on the east, Highway 401 on the north (with a minor extension up Trafalgar Road), and Lake Ontario shoreline on the south. It includes 36 local United churches. Welcome to the home of open-minded discussion and exploration of spiritual topics, moral issues and life’s big questions. You’ll find lots to talk about in our Discussion Lounge, and you’ll get your very own Profile Page for telling others a little about yourself, starting a blog, or sending and receiving wondermails. So pull up a chair and join in. We are…… a place where the hungry and marginalized of Burlington and the surrounding area can come to receive the help for the necessities of life and the compassion deserving of people as individuals, be they children, the elderly, homeless or the disabled. Habitat for Humanity Halton is a community-based, non-profit, faith-based organization working for a world where everyone has a safe and decent place to live. Our mission is to mobilize volunteers and community partners in building affordable housing and promoting homeownership as a means to breaking the cycle of poverty. PAR is a convenient way to make your monthly offering to your church and the Mission and Service Fund. 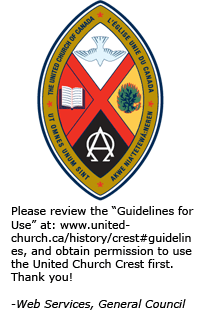 This is a service for the local church administered by the United Church of Canada. Year-Round Congregational Stewardship Plan – This year round plan, in a downloadable RTF file, helps congregations integrate stewardship into their preaching, worship planning, and stewardship/education/mission throughout the year. It provides detailed monthly charts that congregations can adapt to their own context, as they ask and account for gifts. Spirit Connection is an award-winning television program produced by The United Church of Canada at Berkeley Studio and broadcast from coast to coast each week on VisionTV. The show focuses on stories of faith in action and profiles of people who seek to renew their communities and congregations in The United Church of Canada and around the world. The series has been on the air since 1988. The United Church’s global partnership commitments include sending overseas personnel in response to requests from overseas partners. Read about current United Church personnel and the global partners they serve. The United Church’s annual report presents a snapshot of the church and some of its work in 2009. In its pages, you will find pictures and stories about our people, our faith, and our commitment. The report helps us celebrate our denomination, inform newcomers of the breadth and diversity of our mission, and inspire others to support our work. How can we change our own congregation’s culture to reach out to people who are not yet connected with a faith community.